This post was first published at the ePSI Platform and the Open Knowledge Foundation blog. Open (Government) Data as it is understood nowadays can still be considered a new concept. It started to gain traction worldwide since the Obama memo in early 2009 and the launch of data.gov a few months later. Following successful leading examples of the US and UK governments we have seen Open Data flourishing all over the world over the last three years. More than two hundred Open Data catalogs have been identified so far. But still, it’s not always clear how to deliver good solutions and many questions remain unanswered. In order to build sustainable Open Data initiatives in a varied range of countries a broader view to address challenges is needed. New and existing initiatives willbenefit from shared knowledge and will also produce a range of resources that should be published in a freely and open way for others to reuse. As the Open Data movement is growing worldwide; the number of available resources is also increasing. The scarcity of only 3-4 years ago is ending but the resources are appearing in disparate places and formats, sometimes difficult to find and share. There is a pressing need to compile and document existing resources that are verified, trustworthy, comparable, and searchable. 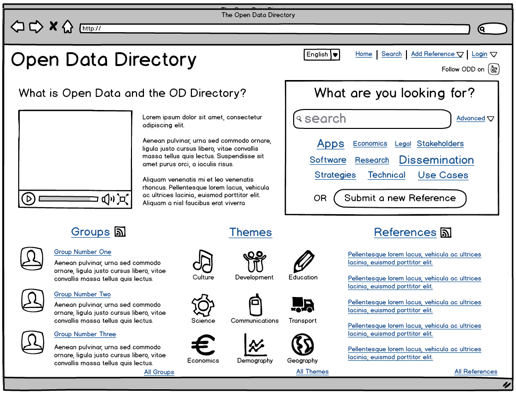 Upon discussions with many in the Open Data community, an initial analysis of their own project needs and preliminary research on existing public resources, the Web Foundation believes that the community at large would benefit from a central entry point to Open Data related resources at a neutral source, the Open Data Directory (ODD). This ODD will help to produce clear evidence base of the benefits of Open Data holding a wide range of resources types such as: use cases, case studies, stories and anecdotes, methodologies, strategies, business cases, papers, reports, articles, blog posts, training materials, slide sets, software tools, applications andvisualisations. The directory will not focus on compiling a vast number of references, instead it will give priority to high-quality references endorsed by the Open Data community. As a first step towards the ODD, we are making public the Use Cases and Requirements Draft in order to get comments from the wide community, not only on the content of the document itself but also on the overall idea of the ODD. We’ve published it as a Google Document with comments turned on. This is a tool for you, the Open Data community, so suggestions, feedback and comments are very welcome. The extended deadline for submitting comments is: April 29th, 2013. This entry was posted in Best Practices, Capacity Building, Community, English, Open Data, Open Knowledge, World Wide and tagged bestpractices, community, english, odd, okfn, opendata, webfoundation by Carlos Iglesias. Bookmark the permalink.